Any Asparagus fans out there? I love how simple it is to prepare and if you can get it on sale you can pick up a whole bunch of it to use in meals through out the week. 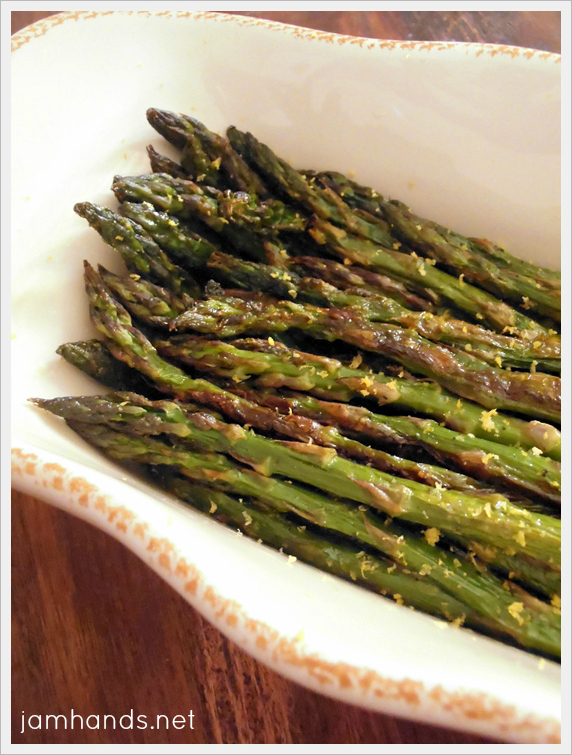 In the past I usually have made roasted asparagus simply with a plain olive oil, garlic (either minced or embarassingly powdered garlic too), and salt and pepper. Top that with Parmesan cheese and it is a tasty side dish. I wanted to try something a little bit different so I went with using a Citrus Olive Oil this time around, and after it is roasted I zested a lemon over the top. You can typically find citrus or plain lemon olive oil at specialty food stores. 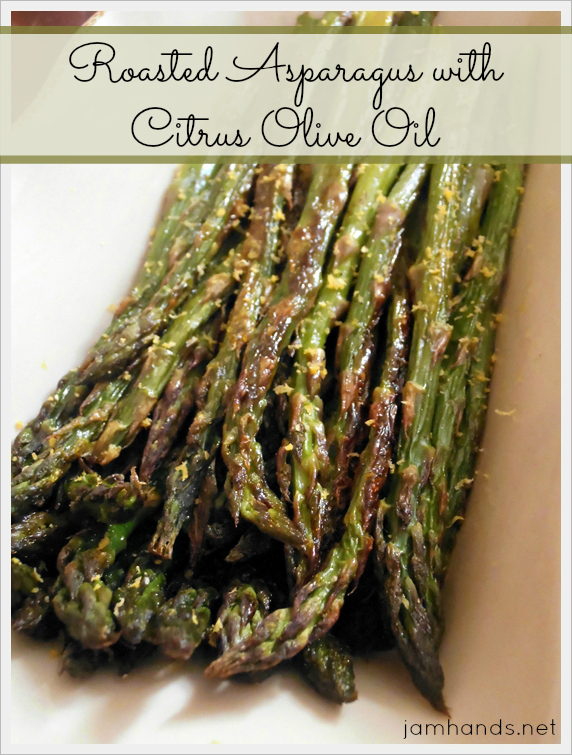 The oil I used was a blend of lemon and orange, but if that isn't available, a lemon olive oil works well too. An alternative to buying premade citrus olive oil is to make it at home, which will probably save you money. Here is a recipe with good reviews at Food.com. Simply subsitute some of the lemon for orange if you want to make it a citrus blend. 1. 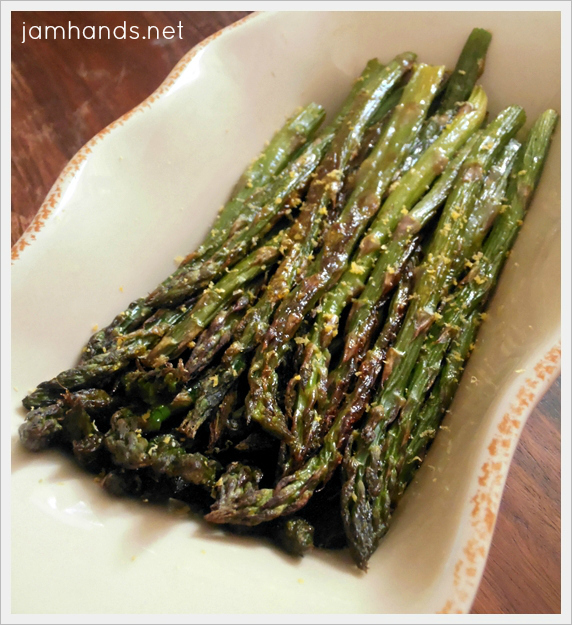 Clean and cut off tough ends of asparagus. Place on a large baking sheet. 2. Drizzle lightly with citrus infused olive oil. Roll asparagus around in the pan to coat evenly. Season lightly with salt and pepper. 3. Bake at 400-f for 20-25 minutes, until tender. Remove from oven and garnish with fresh lemon zest. Recipe from Jam Hands. Sharing this recipe at the following fun link parties. Ooo! Sounds so good. I have some Lemon Balsalmic Vinegar and Lemon Olive Oil. I think I will try a combo with these. Great idea.